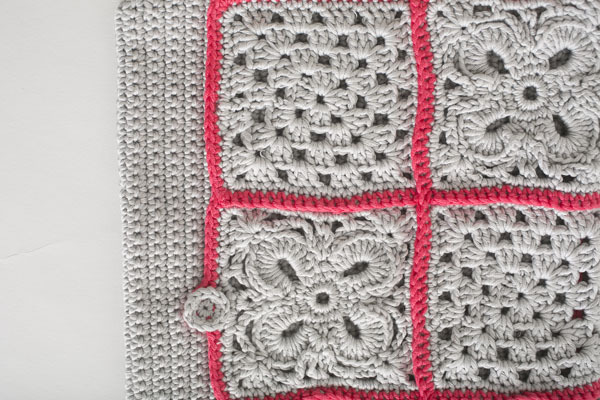 Granny squares — not just for afghans anymore! 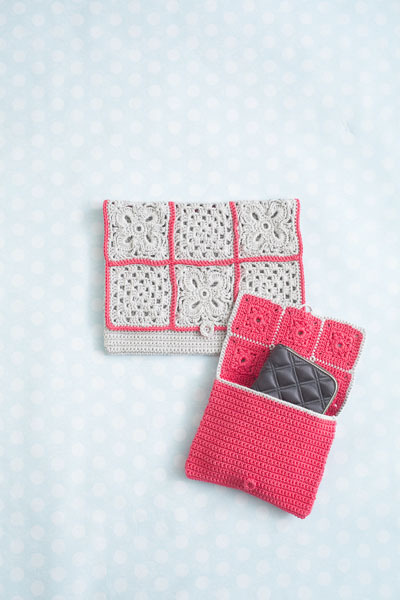 This set of two granny square clutches, one large and one small, utilize granny squares to create the perfect vintage accessories. With Coral make foundation ring: Ch 6 and join with a sl st to form a ring. Rnd 2: Ch 3 (count as 1 dc), 2 dc into top of cluster, ch 2, 3 dc into same stitch to make corner, *dc in 2 ch space, dc into top of cluster, dc in 2 ch space [3 dc, ch 2, 3 dc] into next cluster; rep from * three times more, join with sl st into 3rd chain of 3 ch. Rnd 3: Ch 1, 1 dc into same place, 1 dc into each dc and chain spaces of previous round, working 3 dc into 2 ch spaces. Fasten off and weave away the ends. Lay out the squares in two rows of three squares each. You will be joining the squares horizontally first, then the two vertical rows. 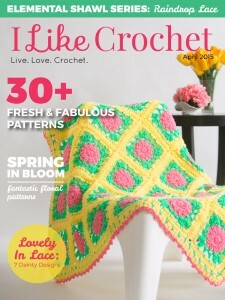 With right sides facing you, join light grey yarn in the 2nd sc of the 3-ch corner space. Sc across each stitch in both motifs, inserting the hook through both motifs at the same time. Finish at the 2nd sc of the 3-ch corner space of the final motif. Use the same method to join the motifs vertically. Work 66 more rows in sc. Fasten off and weave away ends. Rnd 1: Ch 1, 4 sc in ring. Do not join with a sl st.
With right side facing you, fold the bottom of the rectangle upwards so that the body forms a pouch. 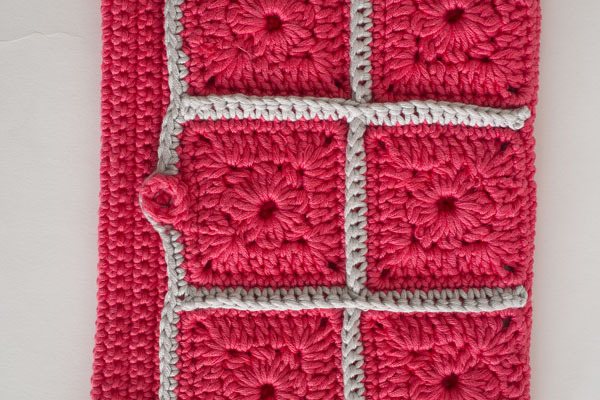 Using coral yarn, neatly sew the sides of the rectangle close. Turn the bag out. Join grey in the right hand side top edge of the bag opening. Chain 1. Sc in each sc across of the bag opening and in each sc of the motifs of the flap. Work 3 sc in the 2nd chain of the two corner spaces. When you reach the middle square, make a buttonhole loop by not working into the middle three sc of the square. Chain 5 to form the button loop. Continue working sc in each sc around and join with a sl st to starting chain. Fasten off and weave away ends. Sew on the button using Light Grey yarn. Lightly wet block the flap of the clutch so that the edges are straight. With light grey make foundation ring: Ch 5 and join with a sl st to form a ring. Rnd 1: Ch 3 (count as 1 dc), 2 tr into ring, ch 2, [3 dc into ring, 2 ch] 3 times, join with sl st into 3rd chain of 3 ch. Rnd 2: Sl st along next two dc into 2 ch space. Ch 3 (count as 1 dc), 2 dc into 2ch-space, ch 2, 3 dc into 2 ch-space to make corner, *ch 1 [3 dc, ch 2, 3 dc] into next ch 2 space to make corner; rep from * three times more, 1ch, join with sl st into 3rd chain of 3 ch. Rnd 3: Sl st along next two dc into 2 ch space. Ch 3 (count as 1 dc), 2 dc into ring, ch 2, 3 dc into ring to make corner, *ch 1, 3 dc into ch sp, ch 1, [3 dc, ch 2, 3 dc] into corner space; repeat from * to end, ending with 1 ch, join with sl st into 3rd chain of 3 ch. Rnd 4: Sl st along next two dc into 2 ch space. Ch 3 (count as 1 dc), 2 dc into ring, ch 2, 3 dc into ring to make corner, *ch 1, 3 dc into ch sp, 1 ch, [3 dc, 2 ch, 3 dc] into corner space; repeat from * to end, ending with 1 ch, join with sl st into 3rd chain of 3 ch. Rnd 5: Ch 1, 1 dc into same place, 1 dc into each dc and chain spaces of previous round, working 3 dc into 2ch spaces. Fasten off and weave away the ends. Make an adjustable ring (also known as a magic ring). Rnd 1: Ch 1, 16 sc in ring, sl st to first chain. Rnd 2: Ch 1, *sc in next 2 sc [sc, ch 7, sc] in next sc, sc in next sc; rep from * around, sl st to 1st sc. Rnd 3: Ch 1, *sc in sc, [2 hdc, 13 dc, 2 hdc] in ch-7 space, skip 2 sc; rep from * around sl st to 1st sc. Rnd 4: Ch 6, sl st into sc. Ch 8, skip 2 hdc and 5 dc. [sc, ch 2, sc] into dc, ch 8, skip 5 dc and 2 hdc] sc into sc; rep from start 4 more times. Join with sl st to first sc. Cut off yarn. Rnd 5: Rejoin yarn in ch-6 space. Ch 1, sc, *ch 2, sc in ch-8 space, 3 chain, (3 dc, ch 2, 3 dc) in ch-2 space (corner made). Ch 3, sc in ch-8 space, ch 2, sc in ch-5 space* Repeat from * to * around. Sl st to 1st sc. Rnd 6: Ch 1, sc in same stitch *2 sc in 2-ch space, skip sc, 2 sc in 3-ch space, 3 sc, 3 sc in 2-ch corner space, 3 sc , 2 sc in 2-ch space, skip sc, 2 sc in 3-ch space, sc*; repeat from * to * to end. Fasten off and weave away the ends. Lay out the squares in two rows of three squares each, alternating the traditional granny squares and loopy flower squares. You will be joining the squares horizontally first, then the two vertical rows. With right sides facing you, join coral yarn in the 2nd sc of the 3-ch corner space. Sc across each stitch in both motifs, inserting the hook through both motifs at the same time. Finish at the 2nd sc of the 3-ch corner space of the final motif. Use the same method to join the motifs vertically. Work 98 more rows in sc. Rnd 1: Ch 1, 6 sc in ring. Do not join with a sl st.
With right side facing you, fold the bottom of the rectangle upwards so that the body forms a pouch. Using grey yarn, neatly sew the sides of the rectangle close. Turn the bag out. Join coral in the right hand side top edge of the bag opening. Chain 1. Sc in each sc across of the bag opening and in each sc of the motifs of the flap. Work 3 sc in the 2nd chain of the two corner spaces. When you reach the middle square, make a buttonhole loop by not working into the middle four sc of the square. Chain 6 to form the button loop. Continue working sc in each sc around and join with a sl st to starting chain. Fasten off and weave away ends. Sew on the button using coral yarn.